In the previous post I made an awesome sauce for Brussels sprouts and while the boyfriend and I were raving over those sprouts at dinner, the thought occured that this sauce might work just as well for sauerkraut. Since I love a good sauce and a good experiment, I went ahead and came up with this dish. Was I right? Did the sauce work for sauerkraut? It sure did! This is sauerkraut like you never had it before. Honestly, I have always liked sauerkrat, but never really loved it. 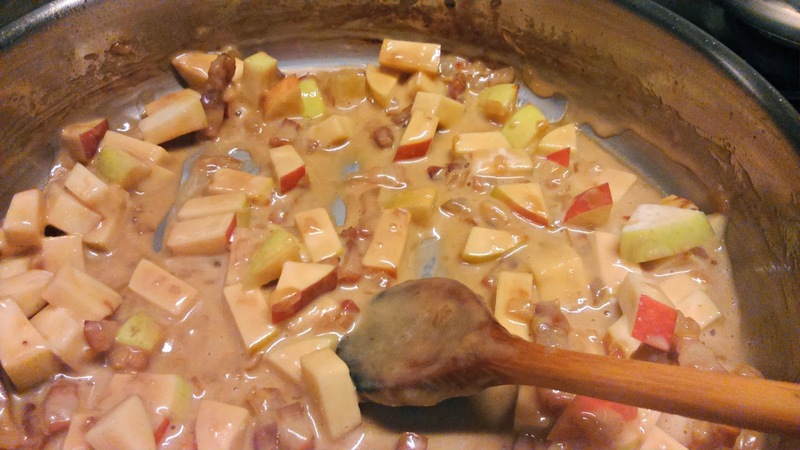 But with this sauce, and the apple...in combination with a good bratwurst, oh my! I will definitely make this again. Take the sauerkraut and rince it well. Put it in a pan and cook it, with about 5 cm (2 inches) of water for about 10 minutes. Drain well and set aside. While the sauerkraut is cooking, reduce the cream in a skillet or saucepan, to about a third of it's original volume (50 ml/2 oz). It should no longer be very liquid, but more like a thick syrup consistancy. Meanwhile, melt the butter in a skillet and sautee the onions and bacon. Add the chicken stock and on a medium to high heat, let it reduce for about 20-30 minutes, (or) until the stock has reduced to about half a cup (125 ml). Add the reduced cream and stir well. It should be a thin sauce consistancy. If it is still very thin, reduce a little more, but be careful not to let it get too thick. It's good enough when it just about coats the back of a spoon. 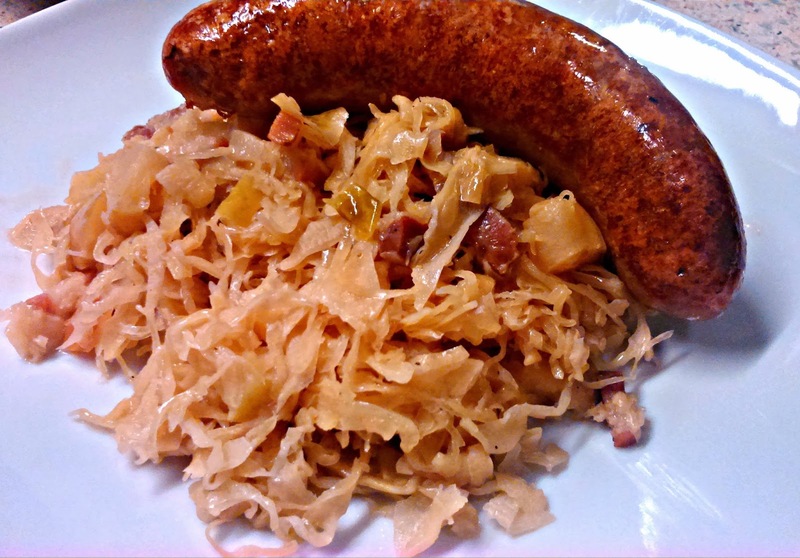 Because I think that both sauerkraut and apple scream for pork, I served this dish with bratwurst. I imagine that any pork sausage, good pork chop or some pork belly will work just as well. I put the sausages in a skillet when I had just put the sauerkraut in the sauce to simmer and the sauerkraut and sausages were done at the same time. Of course, other types of meat may vary in cooking time.